Less than two days before the alleged announcement of Nokia X71 in Taiwan, reliable member of the Nokia community in China Nokibar posted some info about the device on Twitter. Nokibar’s short message said that X71 isn’t Nokia 6.2, which contradicts the FIH OTA info that was shared few days ago. Nokibar shared the sketch of the device, that looks different to the renders OnLeaks posted in early January. Nokibar also has a Nokia N71 in his picture, maybe indicating that HMD is working to name their devices in a more “old Nokia” way. The specs Nokibar shared include Snapdragon 660, 6GB of RAM, 6.4-inch FullHD+ display with a punch-hole, 48MP+8MP+5MP triple camera setup on the back, 3500mAh battery and Android 9 Pie. 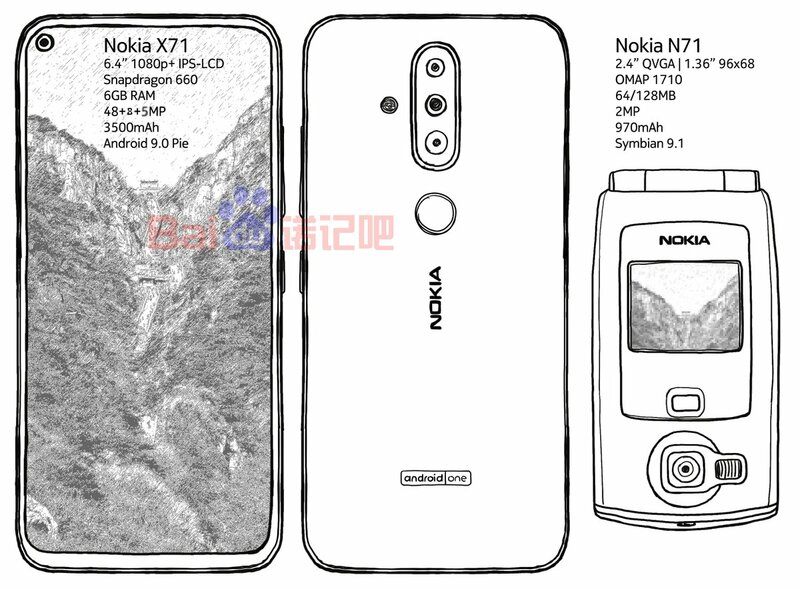 The Nokia X71, based on specs, seems to be placed between Nokia 7.1 and Nokia 8.1. Nokibar saying this isn’t the 6.2 opens up questions if HMD Global is working on two phones with a punch-hole display? Considering the announcement is 2 days away, we won’t need to wait long to find out.